Happy Monday! We have returned from our anniversary vacation and I personally am back in full force. I swear, getting away (if only for a few days or so) really does a number with your energy levels and sanity. In a good way, of course. It’s as if you leave as one little ball of stress and come back as one relaxed and smooth operator. If only we were all able to take holidays whenever we felt even an inkling of anxiety heading our way. That would be the life. I suppose now is a good time to discuss A Blogger’s Dozen. Because it is June and we are halfway through the series already, I wanted to be the one to create the post this month. I love all of the sweet treats that my guest bloggers made just for HSB (see here, here, here, here, and here), but guys, they can be salty as well! So today I would like to take a departure from all of those posts that came before this one, and present to you a creative meal of Burnt Tomatoes and Cheesy Peasy Chicken! 1. Preheat skillet and oil on low heat. 2. Slice tomato into 1/2 inch pieces. Slice green onion into 1/4 inch pieces. 3. Sprinkle salt and pepper onto both sides of the tomato pieces. 4. Place tomatoes in skillet. Turn heat up to medium. Add the green onion. 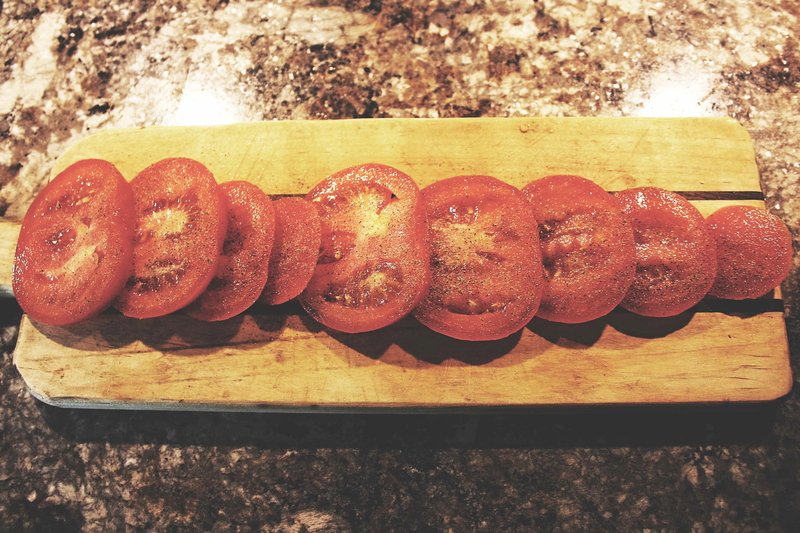 Cook both sides of the tomatoes until they are brown or burnt (approximately 10 minutes). 2. In a medium bowl, add peas, cheese, green onion, butter, salt, and pepper. Mix well. 3. Slice chicken breasts down the centre. Drizzle oil onto and inside of chicken. 4. Stuff the chicken with mixture. 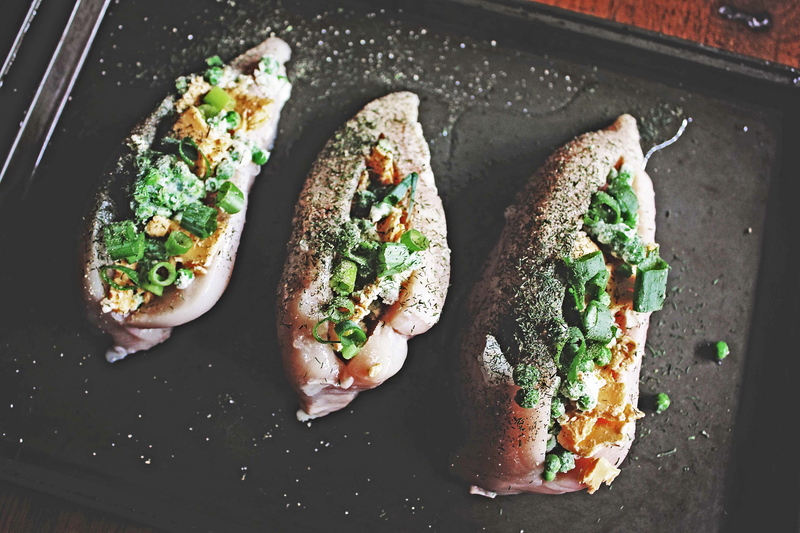 Sprinkle more salt and pepper over chicken breasts. Add dill. 5. Cover the chicken with foil. Place in oven and cook for 1 hour, or until chicken has browned. 6. Remove chicken from oven. Place on a plate, and enjoy the cheesy peasy goodness! 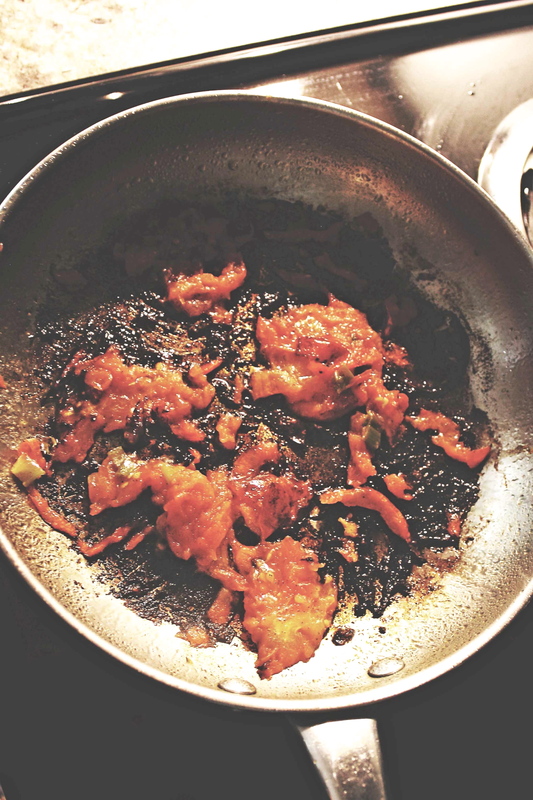 I found the recipe for Burnt Tomatoes in The Kinfolk Table recipe book. My husband and I are starting to limit our carbohydrate intake, so rather than our meals consisting of our usual meat, veg, and carb layout, our plates now look like meat, veg, and more veg. William Hereford’s original instructions called to bake the tomatoes in the oven rather than fry them and to add flour. I wanted to see how I could make the recipe my own, and to shorten the time that it took to make them. Also, adding flour would defeat the purpose of not having carbs. The Cheesy Peasy Chicken actually began as a joke. 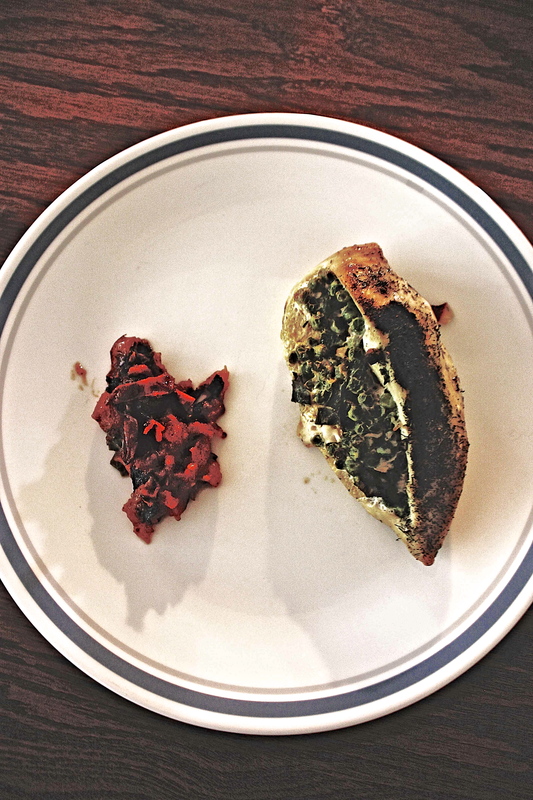 I told Geoffrey that I wanted to make stuffed chicken breast, but knowing that we were low on groceries, he asked me what I would fill it with. I said that I wasn’t sure, cheese and peas? He yelled out Cheesy Peasy Chicken, and I liked the way it sounded. I made it, and it was delicious. This look so yummy! I’ve been on the hunt for easy yet delicious dinner recipes, so I’m going to have to try this! Wow, this combination makes my taste buds dance! I’ll bet the charring of the tomato really lets the flavour develop. Great Recipe!